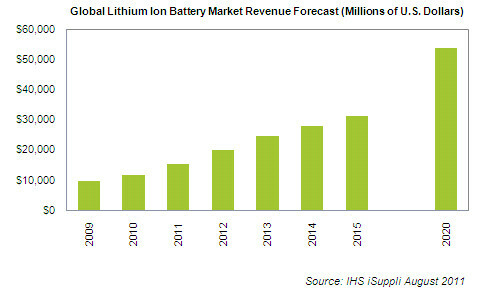 Driven by plunging prices and accelerating demand from the electric and hybrid automobile market, lithium-ion will emerge as the world’s leading rechargeable battery technology and achieve 350 percent revenue growth from 2010 to 2020, according to a new IHS iSuppli Rechargeable Batteries Special Report from information and analysis provider IHS. 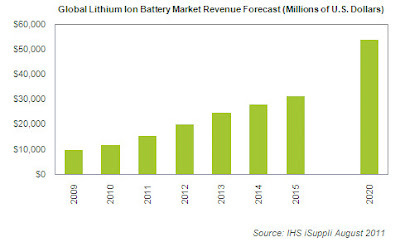 Global lithium-ion battery revenue is expected to expand to $53.7 billion in 2020, up from $11.8 billion in 2010, as presented in the figure below. Revenue will rise to $31.4 billion in 2015, allowing lithium-ion to surpass the current dominant rechargeable battery technology, lead acid. While lithium-ion will find wide usage in mobile electronics products such as cellphones and notebook PCs, usage in cars will fuel the bulk of sales growth. Lithium-ion delivers several enhancements compared to other rechargeable battery technologies. These advantages include more flexible form factors and lighter weight. Furthermore, lithium-ion devices have no memory effect, meaning they maintain their full capacity even after a partial recharge. Finally, lithium-ion batteries are considered to be more environmentally safe than other technologies. These features make lithium-ion particularly attractive for electric vehicles, hybrid electric vehicles and plug-in hybrid electric vehicles. Because of this, the automotive segment will be the leading market for lithium-ion batteries by 2015, surpassing the current top application, notebook PCs. The dominant battery technology used in hybrid cars now is nickel-metal-hydride. More than 1 million hybrids with nickel-metal-hydride batteries were shipped in 2010, led by the Toyota Prius. However, shipments of nickel-metal-hydride batteries to the hybrid market will not grow in the future as the use of lithium-ion begins to take off. While automotive will be the dominant market for lithium-ion batteries, notebook PCs and cellphones will remain major markets for the technology, accounting for $12.3 billion in revenue in 2010, up from $7.8 billion in 2010. Other major uses for lithium-ion batteries include use in solar power systems, smart electricity grids and electric tools.